For the ultimate “why didn’t I think of that?” feeling: Keybrid. 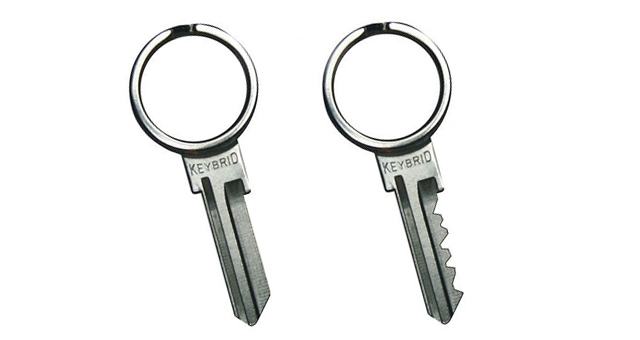 The combined ring & key simplifies your keychain and cuts down on the clutter. Keybrid was founded in 2010 after founder Scott Amron made a low-res mock up of the idea and it went viral, leading to 80,000 purchase inquiries. The Keybrid comes in two versions, fitting SC1 and KW1 doors, which make up 95% of front door locks in the United States and Canada. While only the silver key is available currently, the company plans to expand their line to include black, pink, and gold keys in 2012. Each key is $8.99 and is they’re available online at The Keybrid Store.